So you all read the latest issue of Brian Vaughan and Fiona Staples' awesome sci-fi family drama and thought I was going to lead with all the S-E-X that happens in there? Nope. The sequence where The Will gives the best cat in all comics the hug of life totally made me gasp when I read it. Saga continues to be a book about great and terrible it is to be a grown-up. Babies need things. People from your past won't let you be. Loved ones come and go in the most dramatic ways and all you're trying to is keep things together. This book is amazing. The horned guy and winged woman having hot relations is only a very good bonus. Given the character's past history, Matt Murdock continues to be surprisingly well-adjusted in Mark Waid's run on Daredevil. That makes his current travails even more heartfelt, as he deals with best friend Foggy Nelson's cancer diagnosis and a mysterious enemy obsessed with replicating his powers. Reading this stretch of Daredevil, you can't help but feel a twinge of tenderness at how Matt Murdock has finally pulled his life together. He's not crazy, doesn't have a psych girlfriend and can, y'know, smile. That's why the genuine uncertainty of what's going to happen Foggy is so compelling. If Matt loses the one guy who really, really gets him, then… yeah, let's not even talk about it. 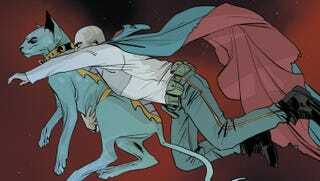 So this is it: Grant Morrison's tenure on Action Comics ends here. I'll be honest and say that looking back I like the writer's take on Kal-El in All-Star Superman better than this monthly run. But Morrison's execution on the New 52 Superman has given me some memorable moments that I'll remember: the singing spaceship tugged at my heartstrings, the trash-talking (if you were Superman, you'd do it, too) and the sense of Superman growing ever more larger-than-life in the early part of his career. I probably won't stay with this book given al the creative turmoil on it so I'm fine with saying goodbye here.